I have an upper and lower dental partial that have metal clamps which connect to my teeth. Is it possible to have the metal pieces colored pink to match my gums? I am very self-conscious when I smile and the metal is showing “gleaming.” Is this procedure possible and what will my price be? Thanking you in advance for your assistance with my current situation. Unfortunately, I don’t believe there is any way to make the metal clasps on your removable partial pink. These metal clasps need to be flexible, and anything your dentist would bond to it would break off under the bending stress. However, the gleaming that you get from light reflecting from the clasps can be toned down dramatically with a little sand blasting—something very simple to do. If your dentist doesn’t have a little “micro-etcher” device to do this job, his dental laboratory certainly would, and this is such a simple procedure that, if they didn’t offer to do it for free, the charge should be minimal. You could maybe even stop off at the dental lab yourself and have them do this. It will change the metal from being shiny and gleaming to a matte finish that doesn’t reflect much light. 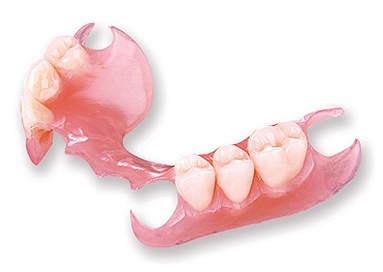 For others who are in the market for new removable partial dentures, the new plastic clasps that can be either pink or transparent are much less obvious to people, and while these partials may not be as sturdy, I believe they are sturdy enough and are way more aesthetic. There are various brands of these. The photograph here is of a Valplast partial. DuraFlex is another brand. Are Nesbit partials illegal in Pennsylvania? I had a partial Nesbit on my #2 upper molar (upper right) & threw it out in error at a restaurant. I live in Pittsburgh, PA, & my dentist & the Pitt dental school tell me Nesbit partials are now illegal in PA.
Could you please tell me what states that are close to me permit Nesbit partials? I am not aware of any dental procedure or dental prosthesis being outlawed in any state. Hearing you tell me what your dentist and the dental school said about the Nesbit partial, I thought I would check the most recent version of Pennsylvania’s dental practice act. Not only did I see no mention of Nesbit partials, but I saw no section of the law where any particular dental procedure or device was outlawed. Several years ago I received a report from a patient in Oregon who said her dentist told her that Nesbits were illegal in Oregon, and I remain skeptical about that also. Now maybe the Pennsylvania Dental Board has passed some rule on this, but I am highly skeptical. What could be the case, giving your dentist and the dental school the benefit of the doubt, is that there was some lawsuit in Pennsylvania where the dentist gave a patient a Nesbit partial and was successfully sued, but I think there would have to be some negligence on the part of the dentist for that suit to be successful—a failure to warn the patient of the risks of such a partial. Or maybe what is going on is that the dental school and your dentist are so adamant about the risks of this small partial that they are exaggerating the situation. So if you’re really determined to get another Nesbit partial, I would start by asking around to other dentists in Pittsburgh. If other dentists confirm that it is illegal, then I’m pretty confident that you could go across the border into Ohio or West Virginia with no problem and find a dentist to do this. Having said that, I think you would be better off listening to their strong discouragement on this and getting some other type of tooth replacement—a flipper partial for example. A Nesbit partial is extremely easy to swallow if it comes loose and could easily puncture your esophagus or intestine causing serious medical issues. I had an experience in my practice when I was just out of dental school where I made one of these partials for a patient. He came in later saying that he had lost it. On quizzing I learned that it disappeared overnight, and I warned him that he could have swallowed it in his sleep and urged him to get x-rayed. He wasn’t interested in doing that. And then, when it was time for his next 6-month checkup, I learned that he had died. That story from then afterward spooked me about these Nesbit partials and I didn’t do any more of them. Instead, I would make larger flipper partials that were just as inexpensive. I’m 35 years old, and my tooth number 7 (right lateral incisor) is turning dark and has been for at least 5 years. My endodontist said the tooth is still viable (I was able to feel ice and an electric current, although my response was delayed). There was a possible, very faint horizontal fracture observed on the x-ray, and a root canal was deemed optional at this time. I’m debating between getting the root canal done or pursuing a cosmetic procedure. I’m under the impression that a root canal can weaken the tooth, but I was also advised by the endo that bonding would have to be applied to several teeth in order to achieve a cohesive look. What are the cosmetic options for this kind of issue? Should I go ahead and get the root canal done now since I’ll likely need it in the future, or is it better to hold off and keep the tooth strong for as long as possible. Which option is the least invasive and best for my oral health? To me, “optional root canal” is the same as saying “not necessary to do a root canal.” So why would you want to do a root canal if it isn’t necessary? Either your tooth is infected or it isn’t. If it is infected, a root canal treatment is necessary. Since it’s not, I would leave it alone. And I am skeptical that you have an actual horizontal fracture in the root of the tooth. A crack would be possible. A fracture seems highly unlikely. If you had a fracture, the tooth would be dead. Furthermore, if there were really a fracture, a root canal treatment would be problematic because it would traverse the fracture and thus be susceptible to leaking and failure. Your tooth gradually turning dark could be because of some trauma you had some time ago, at least the five years during which it has been turning dark. Trauma can cause a tooth to build up defenses in the form of what is called secondary dentin. This will cause the tooth to darken somewhat and will also cause the living pulp tissue to shrink which would make your tooth less sensitive to cold or other stimuli. The bottom line is that, from what you’re telling me, the only problem that has been diagnosed for your tooth is that it is turning dark. The solution to that would be a porcelain veneer or direct composite bonding, either one at the hands of a true dental artist. In the unlikely event that you later need a root canal treatment on this tooth, it would be a simple matter to do that after the veneer or bonding, since root canal access is gained from the back of a front tooth. You need to be very careful who you ask to do this cosmetic work because the color manipulation would be quite tricky and you do need to have this tooth match the surrounding teeth. I believe that only 1-2% of dentists have the passion for appearance-related dentistry plus the training to make this tooth look perfectly natural. I would not bond several teeth because it isn’t necessary, provided you have a properly skilled cosmetic dentist. The reason your endodontist is suggesting bonding several teeth is because your basic family dentist would not be able to get this tooth to match any other way. Furthermore, the problem with getting a dentist to bond several teeth is that if he or she doesn’t know how to color match teeth in this situation, they probably aren’t very good at bonding either and would want to crown several front teeth instead. But if you gave me your city, I could find you a dentist who could get the tooth to match – perfectly – with a very conservative restoration. Good luck with moving forward. In my practice, I very much enjoyed seeing children—even children who were difficult to treat. Part of the reason for that was that the pediatric dentist on my side of town was someone I felt was mean and who would put ugly stainless steel crowns on front teeth, so I didn’t want to refer to him. But a big part of it was because I enjoyed the challenge of trying to understand each child and how to get them through the care that they needed. One issue in providing dental treatment to children is the use of physical restraints. Sometimes it is needed, and I want to address two aspects of that restraint. The first aspect is the use of a mouth prop to keep their mouth open anytime I was drilling on their teeth. When I was in dental school doing my rotation in the pediatric dentistry clinic, before I took my turn as the operator I did a turn as an assistant. My fellow dental student was doing a small, routine filling on a baby tooth when our patient bit down unexpectedly, poking the drill through to the pulp of his tooth. We had to call the instructor over and upgrade the treatment to a pulpotomy (the baby-tooth equivalent of a root canal treatment) and stainless steel crown. My partner got a lecture about using a mouth prop and I vowed in that moment that this would never happen to one of my patients—I would always use some type of mouth restraint. 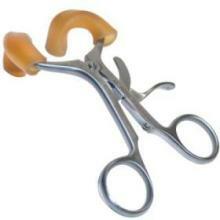 I ended up routinely using a Molt mouth gag on all my child patients when I was using a drill on a back tooth. I never, during dental school or my 20+ years of private practice, had an accident like my dental school partner. But there was a very small minority of child patients that we would run into maybe once every couple of years that would need even more restraint to treat them safely. In spite of all the psychology we could use on them, they would thrash around with their arms and legs, making safe treatment impossible. When this would occur, I would excuse myself to the reception room and ask the parent for permission to physically restrain their child. 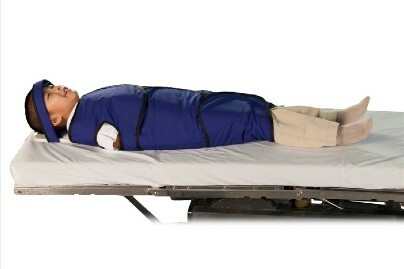 They always gave permission, and we would proceed to wrap them in a papoose and complete the treatment. This technique has been criticized by some as being mean and traumatic to the child. That isn’t my experience at all. These were strong-willed children who refused to cooperate and were determined to make it impossible to fix their teeth; and without general anesthesia it would have been completely impossible to treat them. Once they fully realized that the treatment was going to go forward whether or not they chose to cooperate, they would completely calm down. I cannot remember an instance when that didn’t happen. Sometimes, having become physically worn out from their earlier resistance, they would actually fall asleep as the treatment proceeded. Once treatment was done, we would unwrap them, congratulate them on finally settling down, give them their choice of toys from the prize box, and part friends. I had a root canal and crown done in March 2018, weeks after the procedure I started to have pain. I went back to my dentist who x-rayed the tooth and found no cracks, etc. They referred me to an endodontist in June 2018 and she put me on a course of antibiotics. Two weeks later I saw her again. The pain had for the most part disappeared and she said it would continue to feel better over time. We left for vacation in July and all was well. Then a couple of days ago I woke up with severe toothache. I saw my endodontist the next day she put me on a course of steroids. I’m still in excruciating pain. Throbbing, pulsing pain. Steroids are becoming popular as a treatment for root canal pain. While they’re effective in some situations, there seems to be a certain amount of misuse because of a lack of understanding of the pharmacology combined with a deficiency in diagnostic skills. In your case, steroids are clearly the wrong treatment. Plus there are a couple of other things I disagree with about your treatment. But let’s start with the steroids. A steroid is an anti-inflammatory drug, and a very effective anti-inflammatory. It calms down the body’s response to inflammation. But one thing to understand about the body’s response to inflammation is that there is purpose to it. Part of that response is bringing white blood cells to the area to fight infection. In other words, steroids also act to block the body’s response to infection. This makes it really important for the dentist to know what is going on before prescribing. Is there infection, or just simply irritation? Immediately after a root canal treatment there is ordinarily some irritation of the tissue around the end of the root caused by pushing some of the infected material inside the tooth through the end of the tooth, maybe pushing some of the disinfecting solution and filling materials through the end of the tooth, and possibly from the root canal files actually poking through the end of the tooth during the instrumentation of the tooth. This irritation can cause a vicious cycle of post-operative pain because the inflammation causes swelling of the tissues around the end of the tooth, pushing the tooth up, causing traumatic occlusion, which exacerbates the inflammation, pushing the tooth further up and increasing the pain. Steroids can be an excellent therapy for this situation, though there is some risk because some of the problem is the infected material pushed out of the end of the tooth. For this reason, steroids given to patients post-operatively are often combined with a short course of antibiotics. But when a tooth flares up weeks after, as happened in your case, that is probably going to be solely because of infection. It is much too delayed to be connected in any way to irritation from the actual treatment. That’s why the endodontist prescribed antibiotics in June, which worked. The success of the antibiotic therapy confirms that the problem was infection. But it’s at this point where I begin to disagree with your endodontist. The fact that you had an infection flaring up in the tooth weeks after the completion of the root canal treatment indicates that there was some problem with the root canal treatment. The root canal systems inside some teeth can be complex and it can be easy to miss parts of the system that don’t get fully cleaned out and sealed. So I have a hard time figuring out why your endodontist, who has to know this, would tell you after a delayed post-operative infection in a root canal tooth, that everything is going to be fine now. In most cases, that tooth is going to flare up again with another infection—it’s just a matter of time. And sure enough, several weeks after that, your tooth did flare up. And here is another part of what she did that is puzzling to me. How can it be not clear that this is an infection and not simple inflammation? In my opinion, steroids are absolutely the wrong treatment here. You need another course of antibiotics and, at a minimum, the root canal treatment needs to be re-done because it has clearly failed. This brings me to another part of your treatment that I disagree with, and that is placing a crown on this tooth before being sure that the root canal treatment was successful. The crown makes re-treatment more difficult, since now a hole needs to be drilled in the crown to get access to the roots and visibility is impaired. 3. Extraction of the tooth. Sinus perforation from a dental implant – did the surgeon do it right? My question is about the impact of a sinus perforation, removal of an implant, and antibiotics. I just had a dental implant (tooth #2) removed last Wednesday, six months after it was placed, he suspected bone loss and the gum was not filling in correctly. Also, when he placed the implant it punctured the sinus by a few mm. After the removal, the OS said there was no infection and it was very easy to remove because it did not integrate at all, and there was no need to give me intravenous antibiotics during the process (I was sedated). He put me on sinus precaution of Flonase, no blowing nose, and no sneezing with mouth closed. He said he did not repair the perforation in my sinus, he just cleaned the area and stitched the gums. He said it would heal on its own and we should wait a year to see if the hole fills up with sinus tissue or bone and start again from there. The following week I had continual congestion, especially at night, even though I was using the Flonase. I also had odd crackling in my ear when I moved my jaw (not jaw popping and no pain- just crackling like a blown speaker) I went back to him five days later and he said everything looked great. I did not agree and I requested antibiotics because I felt like it was getting infected. He reluctantly complied and since then my congestion has cleared significantly and air no longer escapes through the site. My question is, was it detrimental to not have been given antibiotics from the beginning and how do you know the sinus has healed correctly and the bone is not compromised with a lingering infection and congestion in the first week? First, answering your question directly, there is no harm in not starting the antibiotics right away. The indiscriminate prescribing of antibiotics, “just in case you have an infection,” is leading to a serious public health problem by helping cultivate antibiotic-resistant bacteria. Then, when you really need the antibiotic, it doesn’t work. So I like the idea that your surgeon waited to see signs of infection before prescribing the antibiotic. And Flonase seems a good choice also. But there is another, more significant issue that you bring up that I want to address, and that is the failure of this dental implant. The implant perforated the sinus by a few millimeters??? That’s kind of a biggie. A few millimeters in dentistry is a lot. And the implant didn’t integrate with the bone at all. That’s another biggie. I hope your dentist has a good explanation for these two kind of serious errors. To be clear here, the idea of the implant perforating the sinus is an issue with oral surgeons, with many maintaining that it isn’t a big deal. Others say that it is an indication of sloppy surgery that just increases the risk of implant failure. Many surgeons will say that they have perforated the sinus many times with implant placement and the site heals and everything is fine. But others will point to cases where this has allowed infection to get in around the implant from the sinus cavity. And then they also point to the issue of how much bone support the implant has. For however much the implant pokes into the sinus, that is that much less bone that is supporting the implant. I believe almost all surgeons will agree that while they may be able to get away with an implant sticking into the sinus one or two millimeters, “a few millimeters” is too far. The standard of care for implant surgery requires the dentist to take whatever x-rays are necessary—preferably three-dimensional ones—to insure that there is enough bone present to stabilize the implant. So my question is, what is your surgeon going to do to insure that this doesn’t happen again? In other words, if your implant ended up so far into your sinus, there’s not enough bone there to support the implant. That would call for some bone grafting. In the area of the sinus, this is usually done in what is called a sinus lift procedure. Has your dentist suggested that? I want to be careful here, because I have an incomplete picture of what is going on with you. But just from what you have told me, if I were getting an implant and my surgeon, in placing the implant, punctured my sinus and there was no osseointegration of the implant with the bone, I wouldn’t want this surgeon doing any more work on me. For you, as a minimum, I would get some answers about this, and maybe a second opinion. I had an upper partial made by a dental lab. I did not go through a dentist. The last partial I got, nine years ago, my dentist used this lab. They did such a good job that I decided to go directly to them this time. But this time it’s not working out so well. I have a front tooth missing that was supposed to be replaced using this partial, however, the tooth won’t stay fastened to the metal. There was so much plastic backing that all the pressure was on my one bottom front tooth. He ground down a lot to make my bite touch but now there is not way of holding this tooth in place. Also the plate is too short and is sitting in the cavity where my old tooth was and it creates a rocking motion when I chew. I have been back at least nine times and the last time he told me to go away and stop bothering him. I asked for my money back but he refused. What can I do to get my money back? A very interesting question, and there are some interesting points to make in answering you. I must say that I’m not following you as far as understanding the problems you are having with the bite and the one tooth in this removable partial denture. The rocking I understand, and that is a fundamental problem that in most cases is due to a distorted framework—a problem that could have originated with a distorted impression. Fixing this would require starting over again. The impression is supposed to be taken by the dentist, who is trained and experienced in creating an accurate model of your teeth that will enable the technician to fabricate an accurate metal framework. Technicians aren’t trained to do this step, which is one of the reasons it is illegal for them to do that. So the answer to how to get your money back is fairly simple—just threaten to report the technician to the authorities. This seems mean because, while it was illegal for him to make this removable partial without involving a dentist, you were the one who asked him to do it, so you should share in that responsibility. But he is the one who knows the law better and so bears the bulk of the responsibility. So just go to him and tell him that if he doesn’t refund your money you’ll tattle to the state dental board and agree to be a witness in his prosecution. My guess is that this will work magic. And hopefully that may save some other patient from making the same mistake you did. Whose fault is it that this tooth broke off? I had a crown put on tooth #7 (right lateral incisor) about 40 years ago but no root canal. My dentist said I now need a root canal on that tooth due to decay under the crown. I’ve had no pain, abscess or any indication of infection. The dentist attempted a root canal through the back of the crown and after 2 hours he gave up and said the canal is calcified and he is unable to locate it. He put a temporary filling in the crown and said I will need an endodontic specialist to perform the root canal. Because I am not in pain, the endodontist booked me an appointment 4 weeks out. Well it’s been 2 weeks and now my crown (with some tooth inside) has broken off and I don’t know what to do. I’m elderly and can’t spend a fortune on this tooth issue when it probably should have been left alone in the first place. Should I just get an implant? Attempt a root canal? I doubt there is enough tooth left to put a new crown on even if the root canal is successful. I bought some DenTek at the drug store today and can reattach the crown myself. I would greatly appreciate your perspective on this. I’m going to start by trying to answer a question that you were too polite to ask: Whose fault is it that this tooth broke off? Your dentist was drilling inside this tooth for two hours looking for the root canal and not finding it. It’s hard not to believe that doing so seriously weakened the tooth and is the reason it broke off. And having done that, he didn’t pass that information on to the endodontist or do anything in the meantime to strengthen the tooth. Hopefully he has learned a lesson from this, but meanwhile you are victimized here. It seems reasonable to me that he should accept some of the responsibility for the fix you are in. With there being decay under the crown, the logical way to proceed here would seem to me to be to take the old crown off (it will have to be replaced anyway), get rid of the decay, and then finding the canal would be much easier. If the tooth really got infected, then the decay penetrated into the canal. But even if it didn’t, having the crown off greatly increases visibility and access. Meanwhile, to answer the question you actually asked, if the tooth is down to a stump then yes, it may be difficult to put a crown on it and you could lose the tooth and need an implant. However, if your bite isn’t particularly stressful, the right kind of dental post in the tooth could enable it to hold a crown, even if there isn’t much of the tooth left. But after the fiasco you’ve been through, I’m doubtful that your current family dentist has enough expertise to pull that off. The placement of the post or posts would need to be done in such a way as to brace the restoration against rotational forces, and that can be tricky. Posts are round and lateral incisors are kind of round in cross section, and it doesn’t take much twisting force to loosen a crown and post in this situation. It’s been ten years since I got my two fillings. One fell out but doesn’t hurt. The other one is still in but is causing severe pain. It doesn’t bother any to bite on it, but it hurts most of the time. The only thing that relieves the pain is water and only for a few seconds. Any advice? I wish I had better news for you, Brandon, but your tooth, the one with the filling, is showing classic signs of a dying pulp and you’re going to need a root canal treatment on it. I’d get the other filling replaced before it’s too late. Here’s what’s going on. There has been some decay get into the tooth, probably getting under the filling. That decay has grown until it has infected the pulp. As the infected pulp tissue dies, it can go into a state where it is called a gangrenous pulp. In that state, it gives off gasses that increase the pressure inside the tooth and cause a toothache. When you cool the tooth with water, it causes the gas to shrink somewhat and eases the pain. This is a classic situation. When a patient reports that cold water or ice water is the only thing that relieves their toothache, you can be 100% guaranteed that they’re suffering from a gangrenous pulp in a tooth that has almost died. Relief can be obtained by simply creating an opening into the tooth to relieve the pressure, but then it needs to be followed up with a root canal treatment to fully remove all of the infected tissue inside the tooth and seal it against further problems. It’s a similar situation when a tooth is sensitive to heat—it’s a nearly dead tooth.